A fact that will doubtless help the RAV4's phenomenal sales growth to continue. It took just four years for Toyota to double sales of the RAV4. That’s a phenomenal achievement and one the Japanese carmaker would love to maintain. Realistically, that rate of growth won’t be sustained, but with the reveal of the in New York last week, plans to increase volume were brought to light by Bill Fay, Senior Vice President, Automotive Operations. “The RAV4 has become our sales leader, a very important vehicle for us,” Fay said. Viewing the three models together, it’s clear from my mind at least the new XSE Hybrid has been positioned as the most premium of the trio. It looks the best, inside and out, and boasts the best performance. “The hybrid is at 10-12% of the mix now, give or take 40,000 RAV hybrids. We’re going to push that to probably 20% of the mix,” Fay claimed. 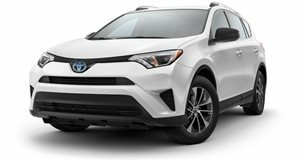 When discussing the hybrid system with RAV4 chief engineer Yoshikazu Saeki later in the day, a telling fact was leaked that—once officially confirmed— will attract plenty of interest in the RAV4 Hybrid. “The first reason for choosing this specific setup was to gain the longest driving distance. In between, if you need to extend the range you can fill up with gasoline quite easily,” Saeki said. A Toyota spokesperson was quick to add the range is “not yet confirmed, these are preliminary figures,” but the cat is out of the bag. The RAV4 Hybrid will have a range of 600 miles, or thereabouts, on a single fill up. Knowing that, doubling sales of the hybrid variant won't be a challenge at all.